As much as the world’s biggest bike brands are frequently heralded for their game-changing innovations and forefront design capabilities, timing is not always part of the equation. 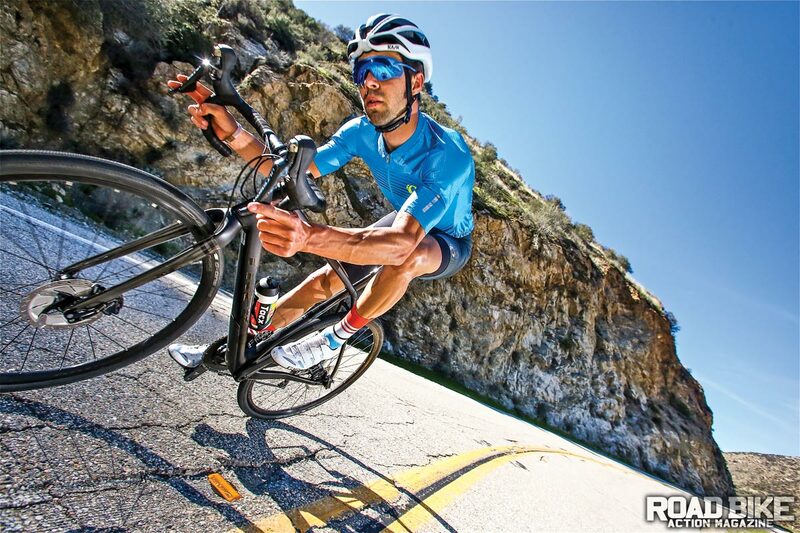 Unquestionably a world leader in bike production and sales, when it comes to the gravel scene, Trek’s entry not only falls in line behind some of their biggest competitors, but also a wide variety of small-guy brands who proved far more capable at shifting their product line to embrace the dual-purpose market. If our history is correct, right around the time that musings of this new gravel scene were beginning to rumble, Trek had gone deep with a big-budget cyclocross program. Although many big wins and championship titles resulted, the restrictive nature of the ’cross-specific bike design couldn’t have steered in a more opposite direction of where dual-purpose technology was headed. Any proper gravel bike needs clearance for big tires, and the Checkpoint can handle up to 45mm tires. 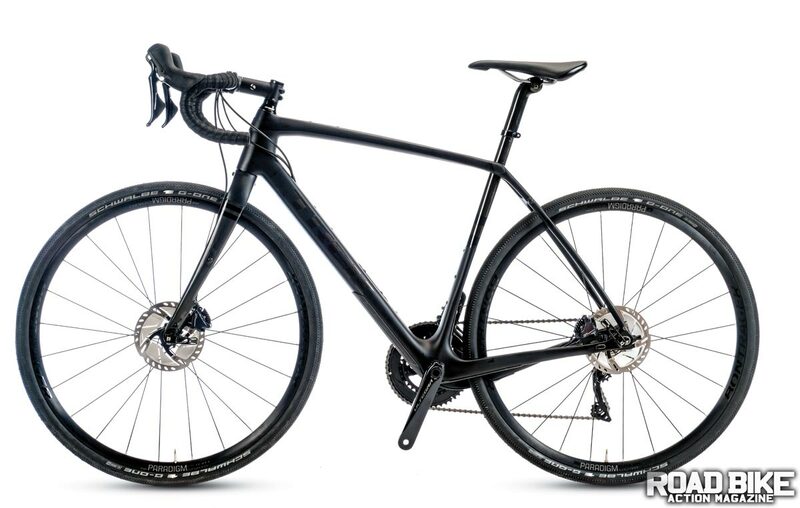 Not counting repurposed cyclocross models, it wasn’t until this year that the word “gravel” finally started appearing anywhere in the Trek lexicon with the (very) soft launch of a Domane gravel bike (basically a repositioned Domane road bike with bigger tires). But now the Checkpoint family has arrived and every bit a true dual-purpose bike, with seven different models in both aluminum and carbon options starting at an entry-level price of $1,789.99. Our Checkpoint SL 6 frame is made with Trek’s OCLV Carbon, which is their patented carbon manufacturing process that they’ve been using since 1991. More notable is that it also uses Trek’s IsoSpeed decoupler rear suspension to help take the edge off the sharp bumps. As with any bike that speaks of Dirty Kanza in its marketing lingo, the first thing we needed to check was the amount of wheel clearance. As it arrived at the palatial RBA office, the Checkpoint rolled with 35mm tires with enough fork/chainstay room to run up to a 45mm tire. Kanza-capable? Check. The asymmetrical chainstays have a great bend to them. The Stranglehold drop-outs are a value-added feature. Beyond the adequate wheel clearance, the most striking feature of the frame is the radically asymmetrical chainstays with a dropped chainstay on the drive side (very much like that found on the groundbreaking Open U.P. gravel bike) to allow for big tires. The Checkpoint boasted its utilitarian intent with a full complement of rack and fender mounts, an extra bottle mount on the underside of the downtube, a top tube mount for a bag and internal cable routing. Trek also built in a bash guard on the downtube to help keep the frame from getting too beat up from whatever rocks or debris that may be thrown up. 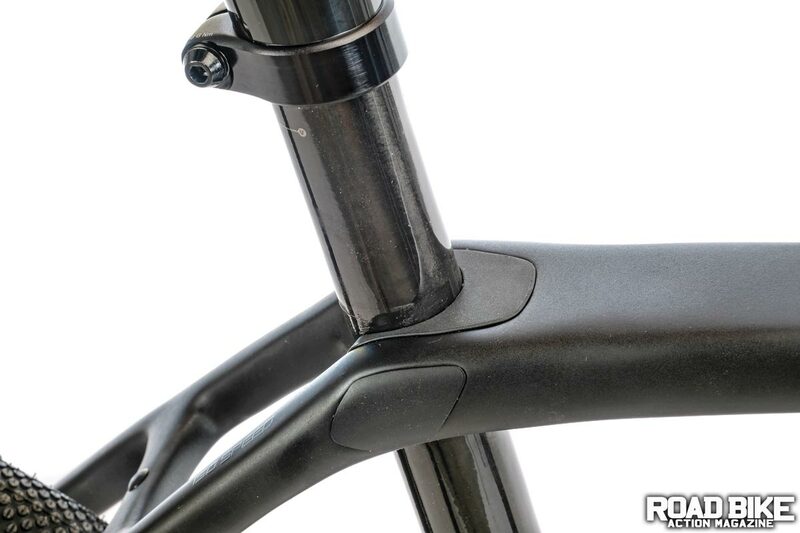 One cool aspect on the Checkpoint is the Stranglehold rear dropouts that allow you to fine-tune your geometry and even convert it to a single-speed if needed. If you’re as over the black-on-black color theme as we are, you can find some interesting color options and save $1000 by going with the SL 5 model. 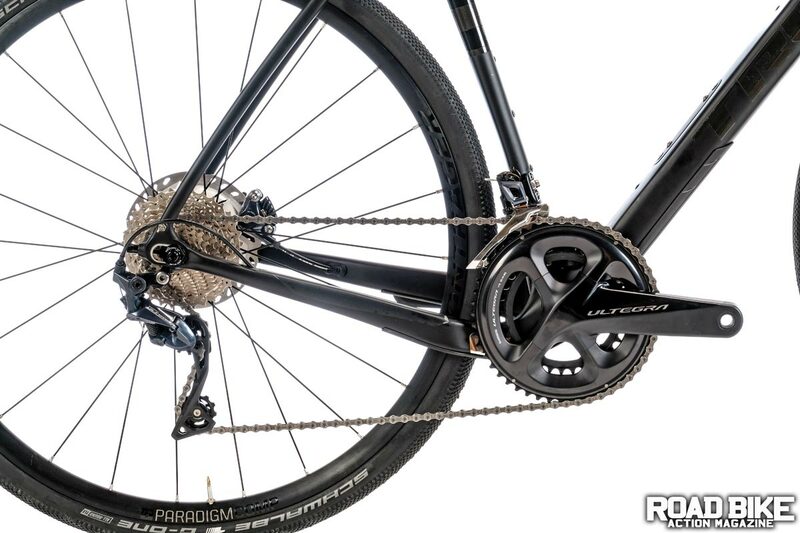 The SL 6 runs a full Shimano Ultegra drivetrain with hydraulic disc brakes. The crankset is a dual chainring with compact 50/34 rings and a rear 11-32 cassette. Trek’s allegiance to Shimano is bolstered by the fact that throughout this new gravel line nary a single model is spec’d with a 1x drivetrain. For the rest of the component selection, Trek spec’d everything from their in-house Bontrager catalog. That included aluminum Paradigm tubeless-ready wheels. The Checkpoint is built for long rides, and with the position in which you sit on the bike, it is more endurance and less of an aggressive style. The 14.5cm head tube length paired with the 41cm axle to crown allows you to sit more upright to better absorb the rough terrain. The 102cm wheelbase (and short bottom bracket drop of 7.6cm) results in a ride that feels more stable and planted to the ground. Trek’s rear IsoSpeed decoupler minimizes vibrations but is non-adjustable. The Checkpoint tracked well, but the weight and geometry of the bike were noticeable when we tried to accelerate hard or even charge up a short, tricky climb. Though the Checkpoint does come with compact gearing and a rear 11-32 cassette, there were times when we longed for a lower gear. We didn’t have the Checkpoint loaded up to the max with the bags, but a bike that is capable of taking on such added weight should have some lower gears to get up the climbs when weighed down. It may have taken Trek a while to join the gravel party, but the Checkpoint’s features prove the time they took was well-spent. This is a bike that aims to be a true dual-purpose bike with as much emphasis on being a capable road/touring bike as it is a gravel bike. Although we’re big fans of the adjustable IsoSpeed decoupler found on the high-end Domane, the non-adjust version still helps bring a smoother ride and lower price, and if you slip on a Lauf suspension fork, you’ll have the closest thing to a full-suspension gravel bike. If you’re looking to tackle the roads of America, be it paved or dirt, the SL 6 is a solid choice for the long-haul ride. With its myriad of accessory mounts, the Checkpoint is ready to be loaded down and to handle varied adventures as well as terrain. If you’re looking for more performance-oriented gravel bike, you may want to look elsewhere. As much as the bike served our all-around purposes well, we couldn’t help but envision a more performance-oriented/gravel-slanted version with the adjustable rear IsoSpeed, along with the front-end Isospeed, a 1x drivetrain and some sweet Bontrager carbon hoops. Oh, yeah, and a splash of frame color to make the ride all the more rewarding. But, that’s another bike at a much higher price point. Still, we can dream.